During one-on-one lessons, I like to customize the lesson structure around your interests. After learning which style of music you like (genre, fingerstyle vs. strumming) along with your overall goals (performing, self-nourishment, community involvement, notation, etc.) I will walk you thru the finer points of music in a fun, easily understood way. Roseville, CA and Grass Valley, CA. 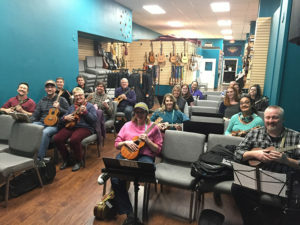 I teach two weekly group classes at The Strum Shop in Roseville, CA. My intro class covers basic chords, mechanics of strumming and intro to TAB. 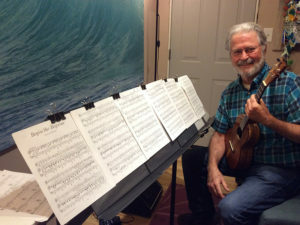 Beyond the Basics is my intermediate class where we explore a new song and technique every month. I host a number of one-hour workshops in various locations. Visit my events page to see when I’ll be in a town near you! 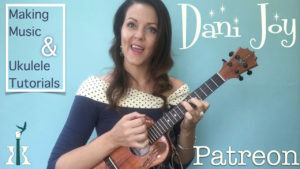 Patreon is an online community forum where I post Song-from-Scratch videos and live Jazz jam sessions so that people from all over the world can learn ukulele together online! This crowd-funding site is an excellent resource for learning from a distance.